Hope everyone has stayed safe from Hurricane Matthew. Heat a sauté pan and add the mixed nuts and olive oil. Sauté and toast for color and flavor. Then sprinkle curry powder and cayenne over nuts. Add maple syrup to pan and let reduce on low heat. When liquid is thicken and starting to crystallize remove from heat and pour nuts onto am parchment paper and sprinkle with sugar to separate and cool, continue to move with a spatula, keeping separated so they don’t stick together. When cooled, place into dish and enjoy as a snack. In a food processor, add chick peas, garlic cloves and olive oil and puree until smooth and creamy. Chop cilantro and add. Mix well. Add more olive oil if it is too thick. Cut lemons and squeeze juice into food processor and add salt and pepper. Blend well. Pour hummus onto serving plate and garnish with chopped fresh parsley. Serve with toasted bagel chips and mixed nuts. Mix the salt and sugar into the water and stir until dissolved. Add the jerk spice and steak seasoning to water and mix. Submerge the tenderloin completely in the water. Then cover bowl with plastic wrap and refrigerate for 3 hours or overnight. Remove tenderloin from brine and rub with jerk spice. Then grill until done about 12 to 15 minutes. When done, remove from grill and let set for a few minutes. Then slice up and place on serving platter. Grill pineapple slices. Dice up grilled pineapple and place in a bowl, then dice red pepper and onion, jalapeño and cilantro and add to bowl. Pour in rum and mix well and season with salt and pepper. Lay salsa alongside grilled tenderloin on platter on either side. Garnish with cilantro and serve. Lay out puff pastry and cut little lines on the edges of both sides in a diagonal- 1 inch in. These you will fold up later for the braided look effect. Cut cream cheese into long rectangle slices and lay along the center of the pastry from top to bottom. The cut guava paste in the same long rectangle shapes and lay on the cream cheese on the puff pastry from top to bottom. When done, begin folding the cut edges over one another, first fold on the left one piece, then on the right, that piece over the first and continue until entire pastry is folded over one another. Take pastry and fold into a circle-wreath shape, pressing the ends together and place on a pre greased cookie sheet pan. Using the egg brush the pastry and then sprinkle raw sugar over it, This will make a glaze. Bake in a 375oF oven for 20 minutes. When done, remove from oven and cool, slice up and lay the slices on the serving platter. Add a dollop of fresh whipped cream, grate fresh nutmeg over it and sprinkle powdered sugar over pastry and serve. Mix the cream, sugar and vanilla in a mixer until stiff peaks are formed. 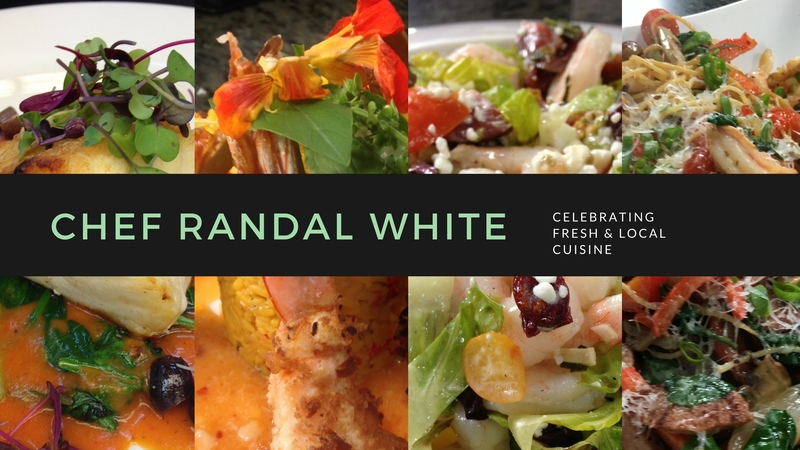 The Chef’s Table with Randal White airs on Gainesville, Florida’s PBS WUFT Channel 5 at 12 noon on Saturdays. Check it out!